In the lands of the Scorpion, no secret is safe. Previously in Marie Brennan’s “In the Garden of Lies (Part I),” the Scorpion Clan’s Yogo Hiroue led the Dragon Clan’s Kitsuki Shomon into one of his deadliest traps: a conversation. Yogo Hiroue excels in manipulation, but what does he want out of Kitsuki Shomon? To what end is he guiding their conversation in the Garden of Lies? 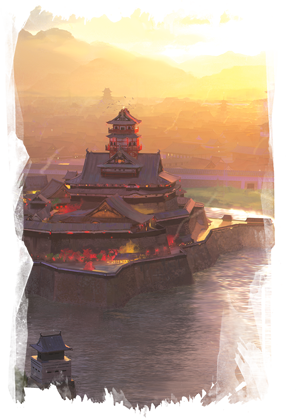 Fantasy Flight Games is proud to present “In the Garden of Lies (Part II)” by Marie Brennan, a new short story set in the world of Legend of the Five Rings. The story can be downloaded here (1.5 MB) and is a direct continuation of the story that began two weeks ago. “In the Garden of Lies (Part II) continues the interaction between the Dragon and Scorpion Clans, as well as examining the motivations of Yogo Hiroue. Check back every other week for additional Legend of the Five Rings stories, and be on the lookout for games in the Legend of the Five Rings universe, including Legend of the Five Rings: The Card Game. Choose your clan and purchase the Legend of the Five Rings: The Card Game Core Set (L5C01) when it releases in the fourth quarter of 2017!